I prefer to buy avocados from Mexico because of that distinctive, earthy taste due to the fertile volcanic soil in which they’re grown. They’re packed with nutrients and are a versatile ingredient that can be used in both savory and sweet dishes—but most people don’t think of using avocados in a sweet dish. The thing I especially love about this recipe is that the light coconut milk and sweetened condensed milk (also known as lechera) don’t overpower the natural flavor so you can still taste the earthiness of the avocado. Surprise your palate with these sweet avocado popsicles. Add flesh of one Hass avocado, 1 1/2 cups Trader Joe's light coconut milk and one 14 oz can of sweetened condensed milk to a blender. Puree until completely smooth. Pour into popsicle molds, add popsicle sticks, and freeze for at least 8 hours. To remove popsicles from molds, run them under lukewarm running water until you can gently wiggle them out. I’ve written here before about why I prefer Trader Joe’s light coconut milk, which is what I’ve used in this recipe, and which doesn’t contain additives such as carrageenan, has low sugar content and has a pleasant, natural coconut taste. Be sure not to mix up coconut cream and coconut milk—there’s a big difference. If you use a full-fat coconut milk that’s too thick, your popsicles will need additional time to freeze. If you can wiggle them out of the molds carefully, store them in a Ziploc baggie in the freezer (you can fit 2-3 in a sandwich-size bag) so they can harden further outside the molds. It’s normal to have a little trouble getting them out of the molds the first time you make them. A few notes about removing these paletas from the molds: The natural oil in avocados means these popsicles will be creamy, and thus need a little longer time to freeze until completely solid. Likewise, when you run the molds under gently running warm water, be sure that the water isn’t hot because it can cause the paletas to melt enough that when you pull the sticks out, the top of the paleta can come off. You should use a standard traditional popsicle mold such as this Progressive International Freezer Pop Maker and wooden freezer pop sticks (both available in The Other Side of The Tortilla’s Amazon aStore, El Mercadito). I don’t recommend using this recipe with a Zoku Quick Pop Maker (also available in El Mercadito) because they really need to freeze for several hours to ensure they’re completely solid. Check out more recipes using Avocados From Mexico on the Always Delicious Avocado Recipes board on Pinterest or upload your own recipe creations to the Avocados From Mexico Community. Tweet, Instagram and Pin with me about Avocados From Mexico using the #iloveavocados hashtag. 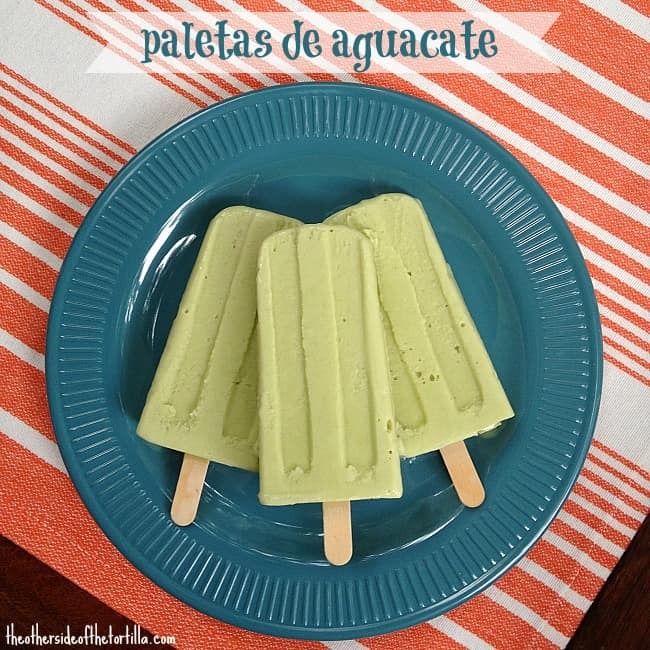 Have you had paletas de aguacate before? Tell me in the comments about your favorite ways to use Avocados From Mexico! 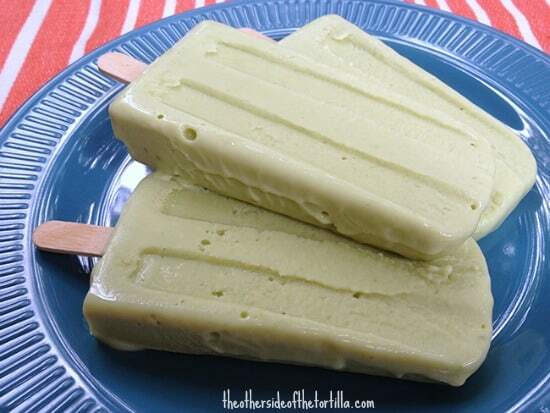 I usually make my avocado paletas with lechera, but I’ve never used coconut milk – what a great idea. I bet it “lightens” them up a bit and lends that beautiful coconut fragrance!